We are delighted that you have taken an interest in our ministry. As you'll see by exploring this website, we offer a variety of activities for those seeking a closer relationship with Jesus Christ and deeper fellowship with other believers. 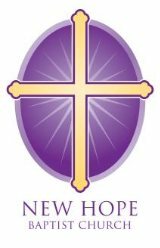 Whether you are just beginning your spiritual journey or you have followed this path for a long time, there is a home for you at New Hope Baptist Church. We encourage you and your family to visit our church and experience the Joy in JESUS CHRIST. Happy Birthday to everyone celebrating an March birthday!!! !